Town was the very first team I had watched from 1959 as I went to the Shay with a friend. At the time I played quite well for a small 13 year old and I was Captain at Greetland Secondary School in 1960. If I recall a man called George Fairburn invited me to a HTFC trial evening where we played on Savile Park where Town used to train. We played a series of games with many other school boys from around Halifax who had been invited. We were watched by staff of Town who were obviously picking out the bright ones. The non starters would be asked to stop playing and watch the next game, I managed to stay on until the end. Nothing really happened in terms of anyone recognising my skills if any but I was invited to become a ballboy at the Shay. The people at the Shay welcomed me and maybe took a liking to me as they offered me an out of school job working on the groundstaff along with Peter Downsborough who later became a great goalkeeper. Peter was older than me and much stronger and much more mature. I remember he used to sneek into the reporters box where there was a telephone link so he could ring his girlfriend free of charge. I did odd jobs like painting railings, cleaning boots, fetching Harry Hooper's cigarettes and sometimes made tea for the players and staff. I loved being around football but being a small 14 year old there was no chance of getting signed up as there were better players around including Walter Ringer and the Worthingtons, Frank, Bob and Dave and Mr Hoopers son Alf. So I decided to take a job I had offered with Jewsons Gun and Fishing Tackle shop, the owner also had Nicholl and Brown Sports shop so I would still have a link with the sport. I now had to work on a Saturday so no chance to play football or watch Town. I used to see Harry Hooper out and about in Halifax, then one day he made contact with me and invited me to go back to the Shay as ball boy for a special event, the opening of their floodlights in Novemeber 1961 when they played Red Star Belgrade, I really appriciated his thoughtfulness and kindness. Not pictured above was my hero George Whitelaw he was a great entertainer, very strong old fashioned centre forward. Off the field he had lots of time for people around him and once when we were on our way to Savile Park for training when I told him my brother was in hospital he said come on lets pop in to say hello and we did, he had no fear of what the boss would say by being late. George was an eccentric guy, a joker but not a fool, he was rebelious, his own man and I can image, for managers, a difficult person to control, maybe this is the reason he played for 9 clubs in as many years, however, he did score 22 goals for Town during his stay. 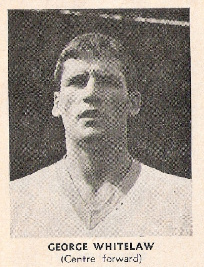 Aged 22, George was signed by Manager Jack Taylor in March 1959. Previously with St.Johnstone, he arrived from Sunderland and made his debut at home to Bradford City on Monday 16th March. He made an immediate impact with a goal after just 2 minutes when he challenged City’s goalkeeper and bundled the ball home. Unusual in appearance, he sported a fringe style haircut and ran with a slightly hunched style with his elbows away from his body. Because of this he was very distinctive and no doubt City’s goalie must have found him to be a formidable figure. Added to this he showed that he was a decent footballer as well and he soon found favour with Rangers fans. If memory serves me right he was nicknamed “Gunlaw” after the TV series on at the time, I remember him best in an away game at Brentford a Brentford defender bounced off him and while he lay on the pitch Gunlaw jumped up and down like a chimp goading him!. I remember going to the Gaumont on a Saturday night after watching George play. At the end of the show the lights went up and we trouped to the exit. There was George still seated in the back row clamped to a girls face oblivious to the fact that the show had finished. He got a big cheer and laughed as he joined the queue for the exit.